This work by Goddess of Cake is licensed under a Creative Commons Attribution 1.0 Finland License. My childhood school was a Walldorf – school, for thirteen years. So ask me any question about the Finnish school system, and I won’t be able to answer you. But I learned how to make pretty sheep out of carded wool and pipecleaner, how to work with copper, how to flutter backwards and left in the eurythmics class, when there is a Minor cadence in the music, and several little poems to say thanks for the food, in the beginning or at end of the day. And yes, since there are many superstitions regarding Walldorf – education, we did learn our maths, biology and physics according to the state curriculum, along the other approaches to life. Maybe the most valuable lesson of a Walldorf – school is that most likely you end up spending most of your thirteen years there with the same classmates, and most likely the same teachers too. A Walldorf – school is a community, and in like any community the people don’t always get along with each other well at all, and don’t like each other either. But somehow, when you rub onto each other for thirteen years, finally the worst edges are gone and maybe you have learned something about the human nature as well. And still, after years I finished school when I meet some of my old classmates, I feel an instant familiarity with them, stronger than with any of my other friends. This Good Friday I spent comfortably with one of my old classmates and her partner. We are such old friends, hold no surprises for each other. My friend always cooks by the recipe; I always cook by the feel. She keeps a beautiful, colourful, neat and clean house, and the story of her life is artistically arranged in photo books. My house is chaotic and mostly outright dirty, and I can’t even recall what I did a year ago, let alone have a photo book about it. We have always been different like that, and I guess we will always remain with our ways. But it is amazing to have a friend that stayed in your life since you were seven years old. Being secular people, we made Easter food already on Good Friday. In our families there are no strong traditions of what savoury foods to make on Easter, so we somehow ended up cooking citrus – themed food, which does have a feeling of Easter to it, maybe because the yellow colour of lemons. Anyway we made an intensely lemony risotto, a salad with a tangy tahini dressing and citrus – infused fruit salad as dessert. This risotto is from the cookbook Tofukeittokirja (a Finnish cookbook on tofu), slightly modified. Mix the ingredients for the marinade, cut the tofu into small squares and mix in, let it marinate for a while in the fridge, preferably overnight. Chop the onion and heat up the oil and margarine in a cooking pot. Throw in the onion and turn it for a minute or so. Add the rice, and let it sauté until it’s translucent. Remember to keep stirring! Next add the lemon juice and zest. Add vegetable stock little by little, stirring so that the rice is submerged all the time. Let simmer, stirring and adding the stock, for 15 to 20 minutes. 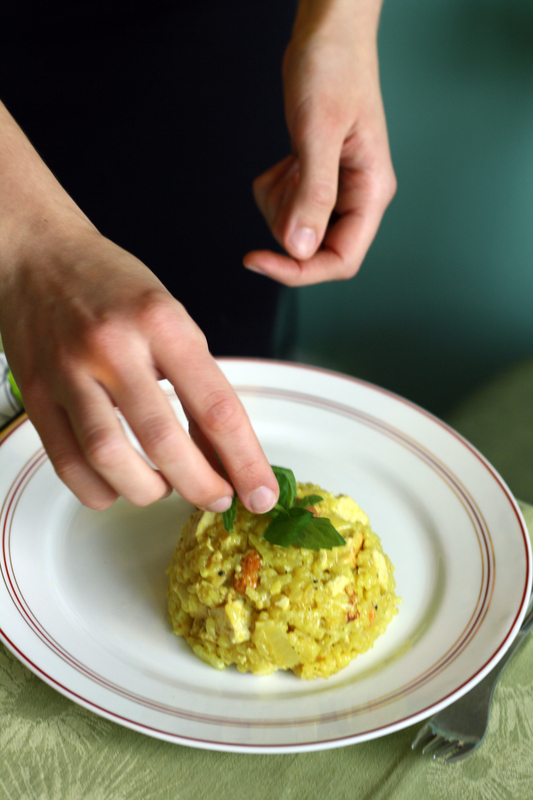 Fry the tofu quickly on a pan, and add it to the risotto, along with a bit of turmeric for a nice yellow colour. 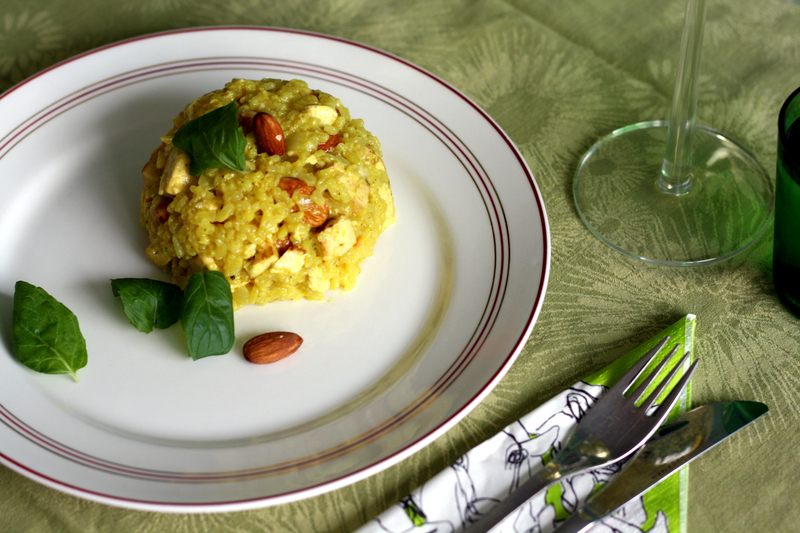 Using a cup as mold plate the risotto and decorate with almonds and fresh mint. Blend everything with a hand held blender. If you prefer a runnier consistency, add some water, but I think it dilutes the taste unnecessary. 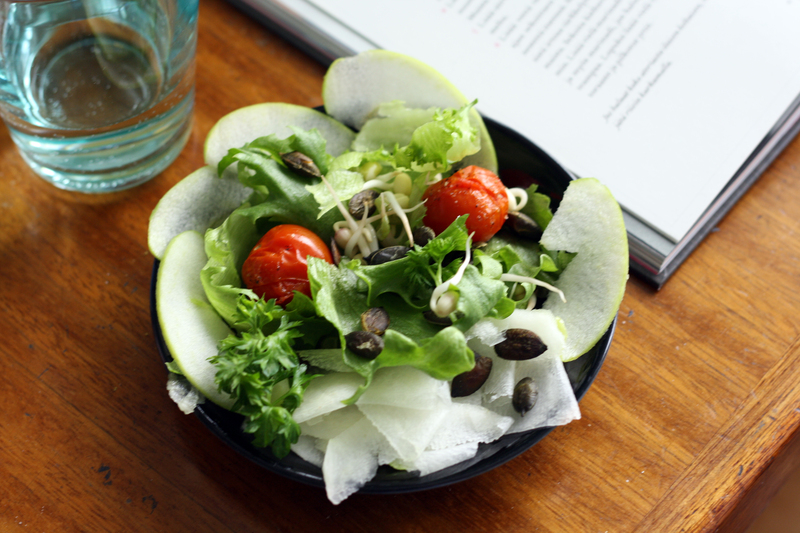 Our salad contained thinly sliced kohlrabi, green apple, mung bean sprouts, oven roasted cherry tomatoes and dried cranberries. 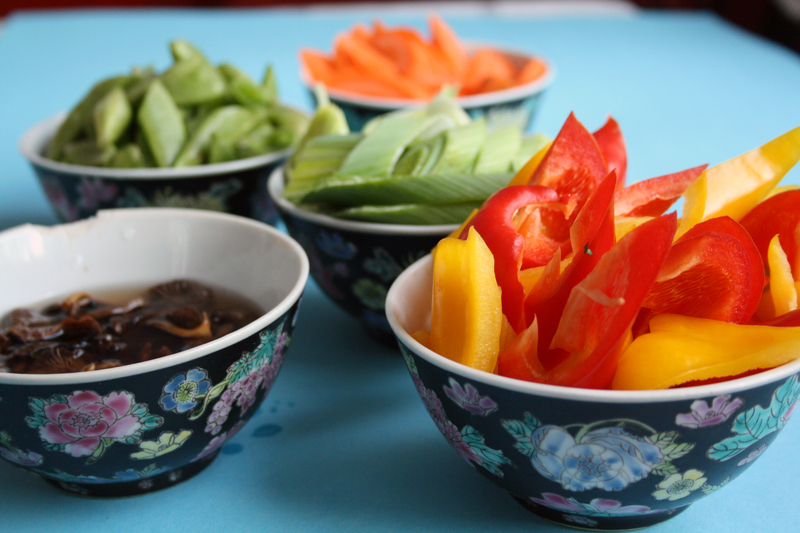 This is vaguely the recipe I used as an inspiration for the fruit salad and lemongrass syrup. The result was delicious, though when cooking the marinade it smelled strangely of Indian incense. 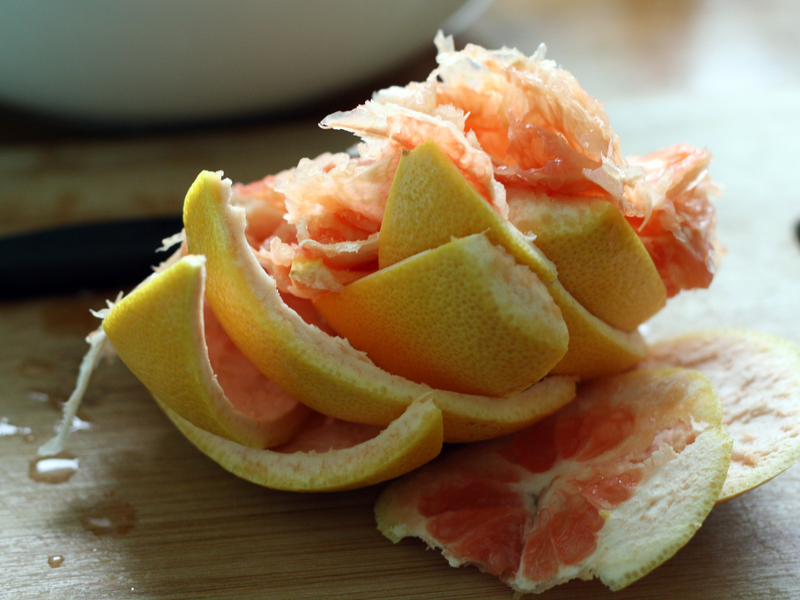 Here are also good instructions on how to segment citrus fruit. Segmenting citrus is definitely worth the bother! 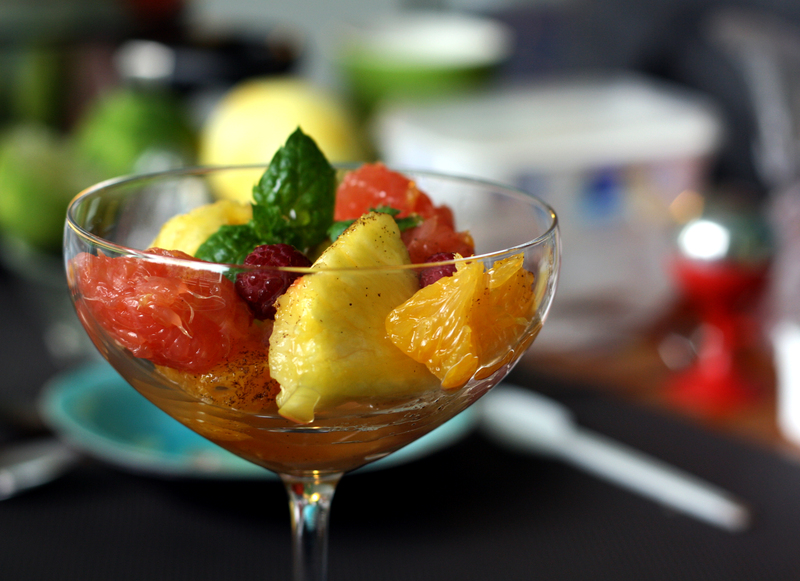 Segment the citrus, and catch the extra juices in a bowl. 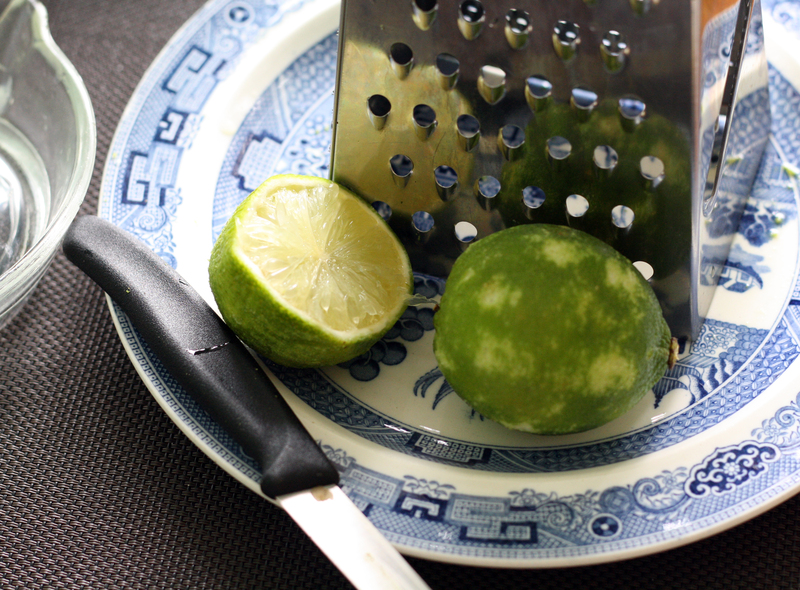 Make the syrup: cut the lemon grass stalks to 3 cm long pieces, scrape the vanilla pod and grate the lime zest. Add all the ingredients to a cooking pot, bring to a boil and let simmer a few minutes. 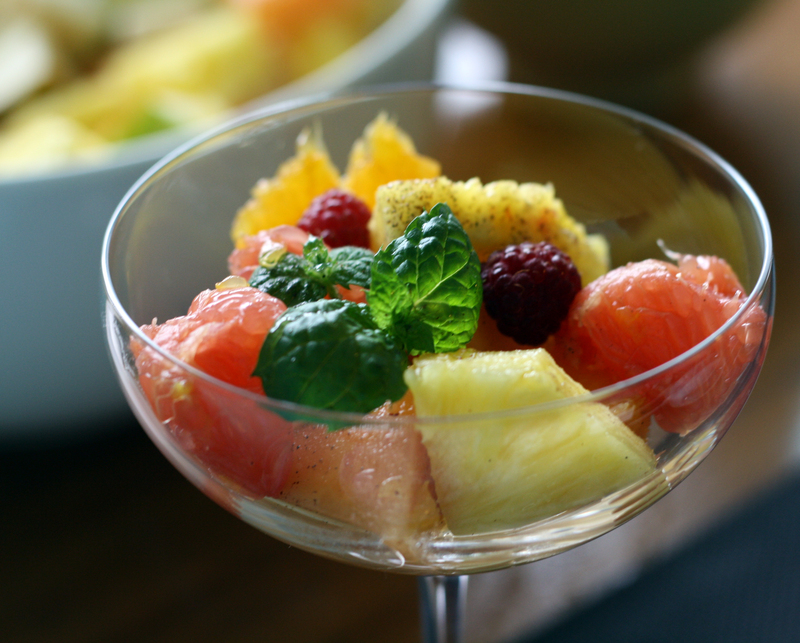 Cut up all the fruit, and add the strained marinade and the finely chopped mint. Let marinate for an hour or so. Our loving thanks to you we give….. The 5th of February is the honorary day of the national poet of Finland, Johan Ludvig Runeberg. He lived in the 19th century and was a popular author of his day. 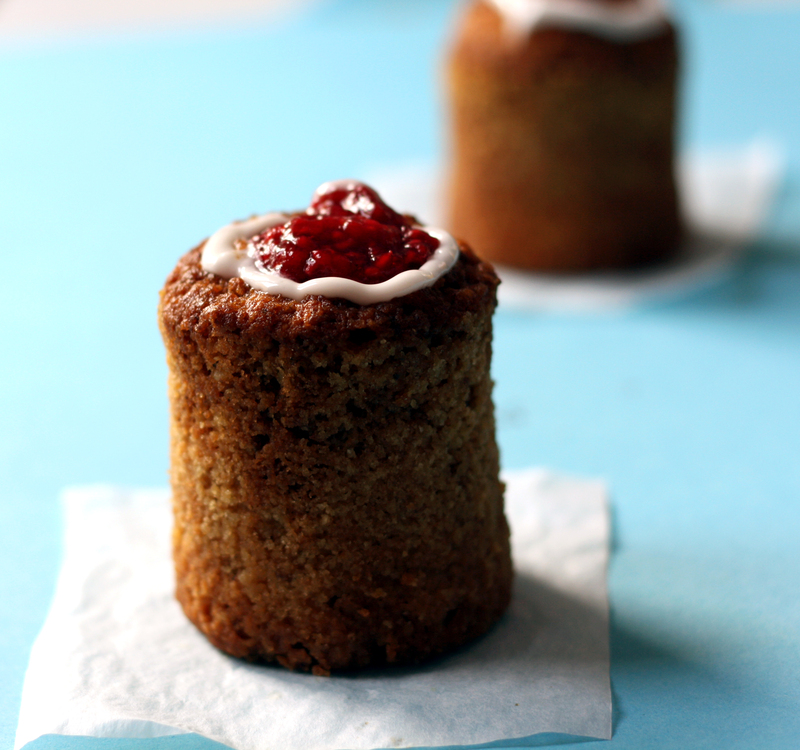 These days we celebrate his memory with a little pastry called Runeberg’s Tart. Runeberg, like other men of his status, had a wife, Fredrika. For over a hundred years Fredrika was only credited for being the wife of Runeberg, and as the inventor of the famous tart. In reality, Fredrika did not even invent this pastry, it was a specialty of a local bakery. Instead, she was an herself an aspiring writer, and a deeply ambitious person. But she was always left in the shade of her famous spouse. In those days before washing machines and vacuum cleaners, her days were mostly filled with household chores that she found absolutely dreary, besides of having to deal with a womanizing husband and financial difficulties. Fredrika, isn’t it strange how still in 2010, a young lady, liberated and educated, like me, would make the choice of trying to be famous with her skills in the kitchen? Why would she do that? Since, between you and me, a pretty young lady with good cooking skills is to most people nothing more than that, however ambitious or clever she may be otherwise. A hundred years after you, Fredrika, I must admit that certain attitudes do sit tight in the society. And all you young ladies who are reading this blog and haven’t started your own, do consider another subject than cooking or handicrafts! Because, to formulate this clearly: after you are dead, do you want to be remembered for a friggin’ cake, named after your husband, or because, for example, winning the Nobel Prize in physics? I think this is something we all should think about, seriously. But anyway, this tart is for you Fredrika, I promise to read your texts one day too. 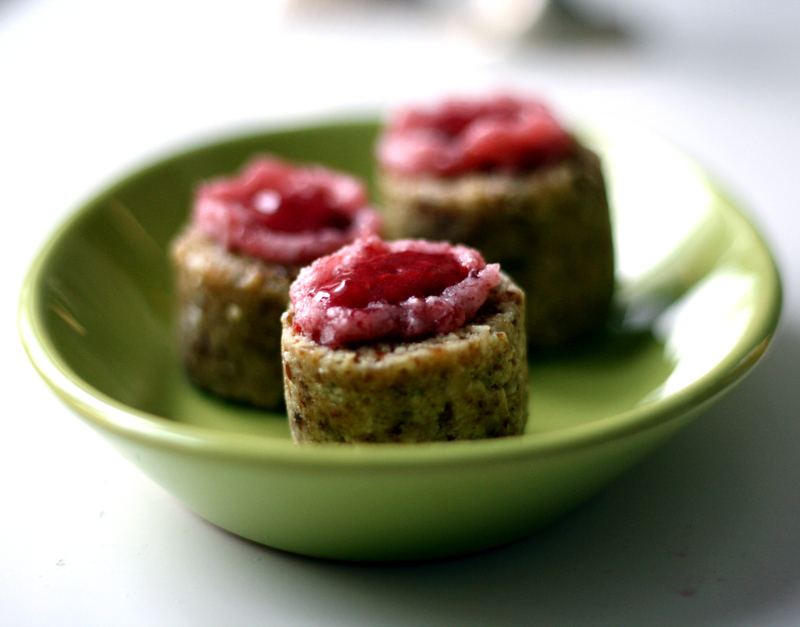 I decided to make a raw version of Runeberg’s Tart. 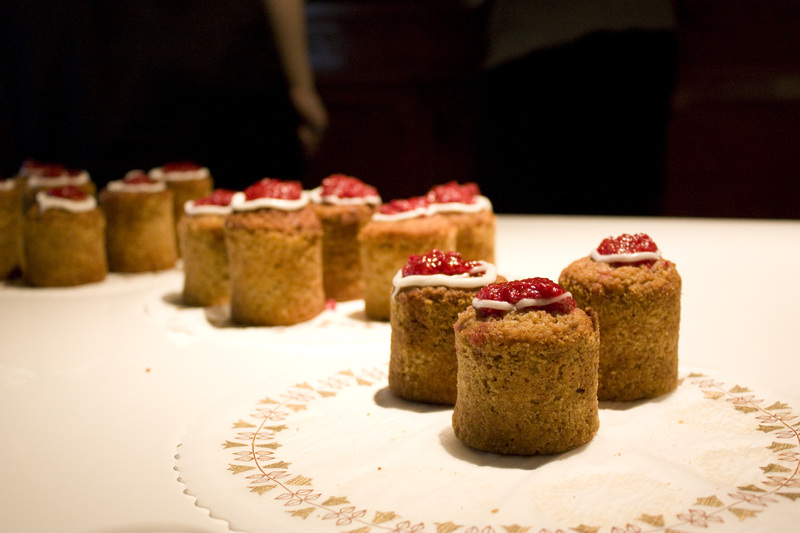 A Runeberg’s tart is a pastry with almond meal, bread or gingerbread crumbles, flavoured with cardamom and moistened with rum or punsch, a typical Swedish alcoholic drink. The tart is topped with some raspberry jam and sugar icing. You can find a nice vegan recipe here. This is how they look made by my friend Rosa, who traditionally arranges each year a party where only Runeberg’s Tarts are served. My raw version contained almonds, lucuma, coconut, cardamom, dates, honey and some rum aroma, which is indeed artificial and not raw at all. But you could leave it out, substitute it with real rum or use bitter almond extract. The pink “icing” was a bit of a challenging part, and I ended up doing it with coconut oil and honey, but later realised that probably also some cashew nut cream would have looked nice. I blended together all the ingredients for the tart with a food processor. Then I formed a round bar with the help of some baking parchment and stuck it to the freezer for about ten minutes. Then I cut the bar into five pieces, about 4 cm tall, and decorated them with raspberry puree and and piped on the icing. The raspberry puree was made with a hand held blender and the icing by simply mixing the ingredients with a spoon. In a sense, in Finland there is no such thing as “winter seasonal food”. Right now the whole country is enveloped in snow, and nothing grows. So if you want to be locavorean and vegetarian in the winter, you eat what keeps: root vegetables, dried mushrooms, sauerkraut, and these modern times what you can find in your freezer, like berries and frozen leaf vegetables. 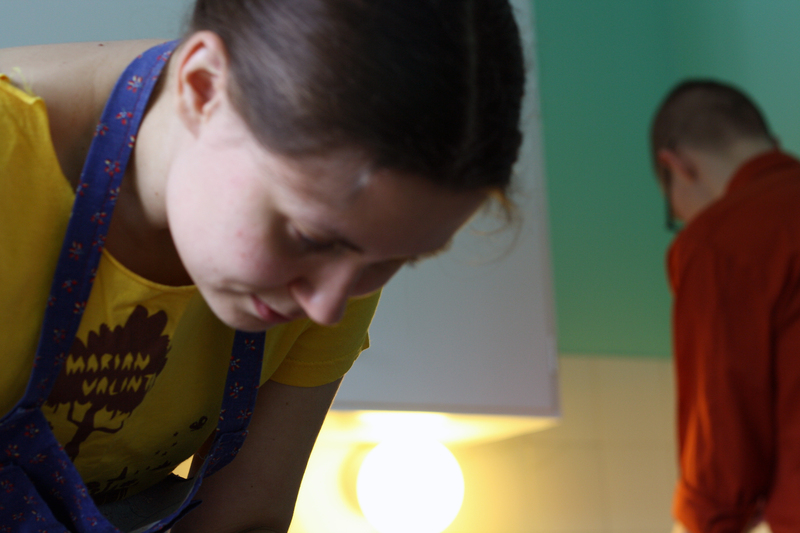 Thinking like a squirrel is essential for a Finnish locavore. If you weren’t industrious in the autumn, bad luck for you. By this I don’t mean that food wouldn’t be available in the supermarket, of course it is, but it just generally isn’t from local sources. But anyway, even if I like the cold and snowy winter very much, I sometimes find myself looking for flights to somewhere… Bali, Thailand, Costa Rica.. I seem to have some infantile yearning for a warm, easy place with smiling people, exotic fruits and long white beaches. I do know how flying affects the climate and in the past I have committed enough environmental crimes in that matter, so I try to satisfy my cravings for far – away places by other means. This time, I decided to travel to Asia by cooking. Buying some non – seasonal, imported ingredients is anyhow a much lesser environmental crime than flying to Bali! I invited a few friends over and visited the Realm of the Chinese People on that strip of street that houses pretty much all the Asian groceries in Helsinki. That already feels like being somewhere else: the loud discussion in Chinese, strange smells and products that have Chinese characters written on them instantly bring you from sleepy cool Helsinki to some hot and intense Asian mega – city. 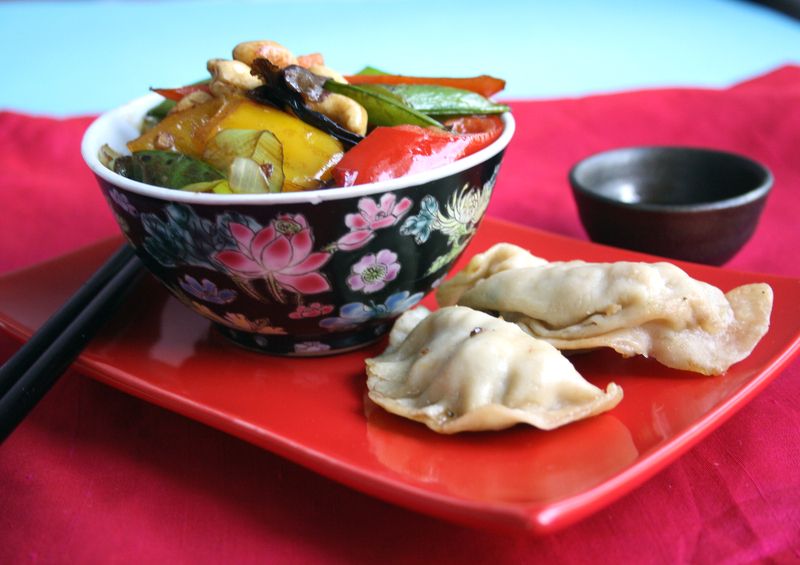 On our cross – Asian menu were wontons filled with tofu and napa cabbage, a vegetable stir – fry with rice – noodles and as dessert sticky rice with mango. 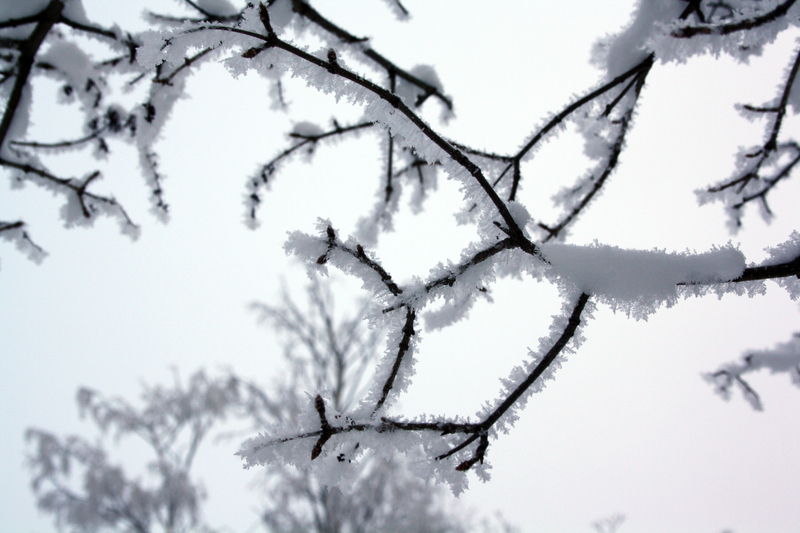 And how nice and exotic the food tasted and smelled, and how refreshing it is to see a bit of colour in this white – and – black snow fairytale! Wonton is a type of Chinese ravioli. 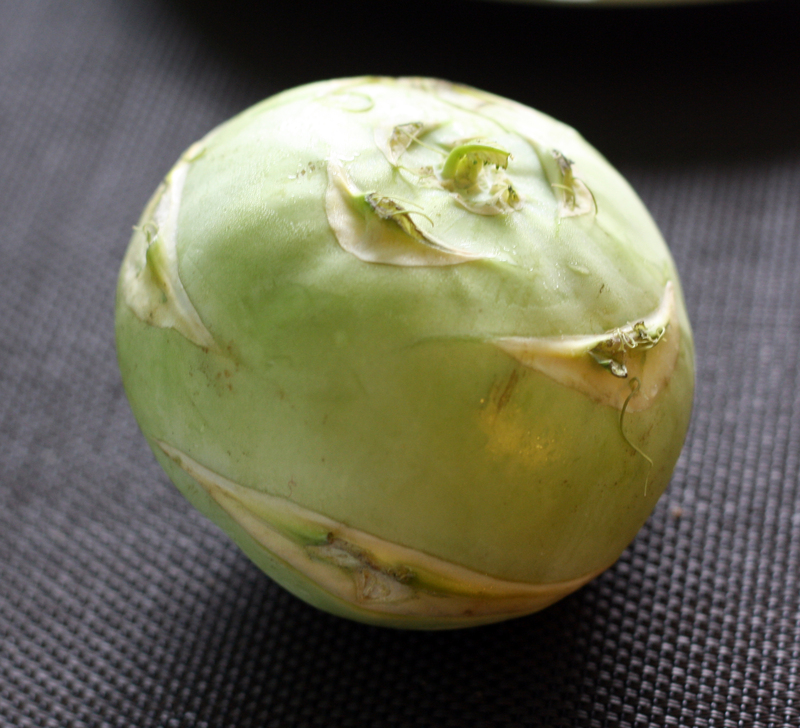 We filled ours with tofu and napa cabbage, which a very common vegetable in the Chinese and Korean kitchen. 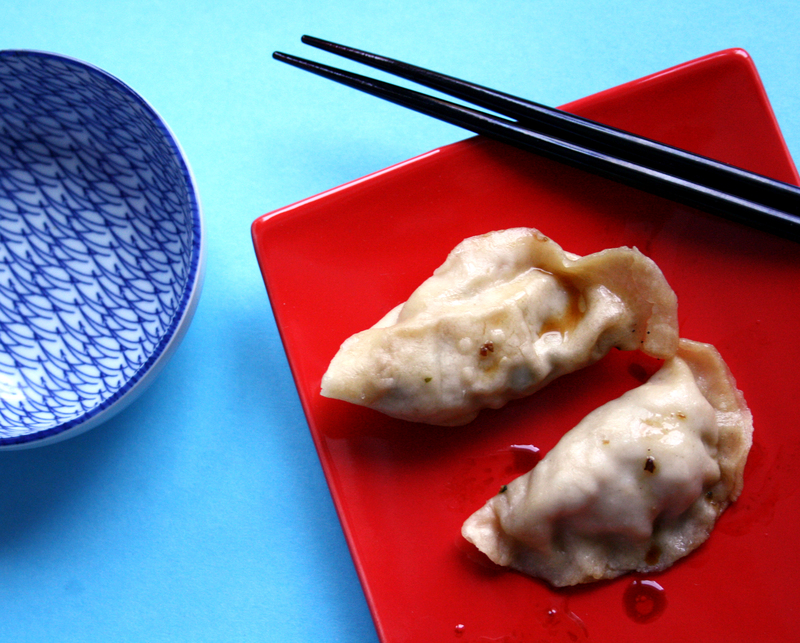 Wontons are steamed or cooked, but they can also be fried afterwards in oil on a pan. First chop the napa cabbage finely and mix it with the salt in a bowl. Let it stand 10 minutes. Crumble the tofu and mix with the rest of the seasonings, then add the cabbage. Mix the flour and the water and let the dough stand covered for 10 minutes. Then form a bar of it and cut it into 32 pieces. Roll the pieces with a rolling bin into thin circles, about 6 – 7 cm in diameter. Put a tablespoon of filling into each circle and fold it over, trying to press out the extra air. 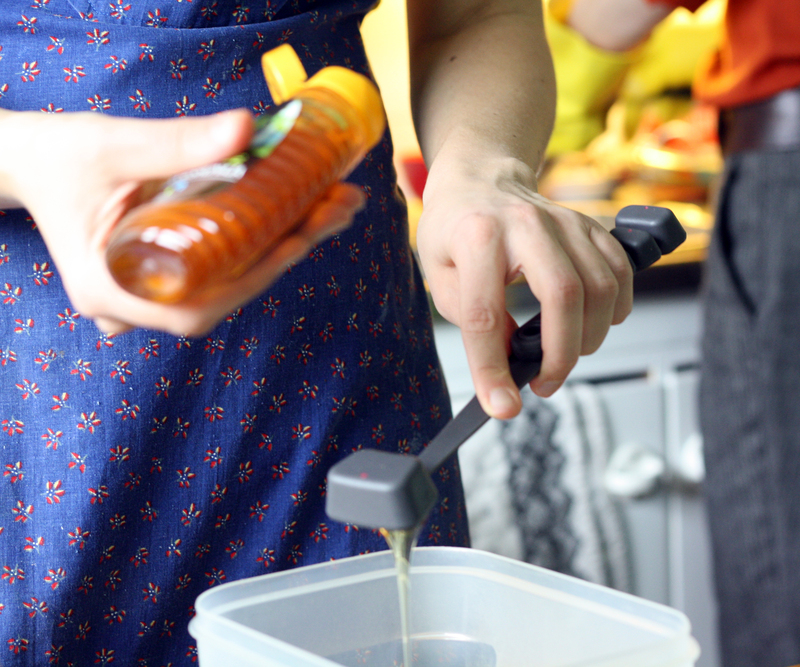 Pinch the edges together, you can moisten them too with a bit of water. There are many different ways to fold the wontons, but we simply made half – moon shapes. Steam the wontons on an oiled surface for 10 minutes. They will stick together, so try to place them so that they don’t touch each other. It’s good to have a large dish with lid at hand for the ready wontons, because you’ll have to make several batches unless you happen to have a really large steamer. Mix the ingredients and eat with the wontons. 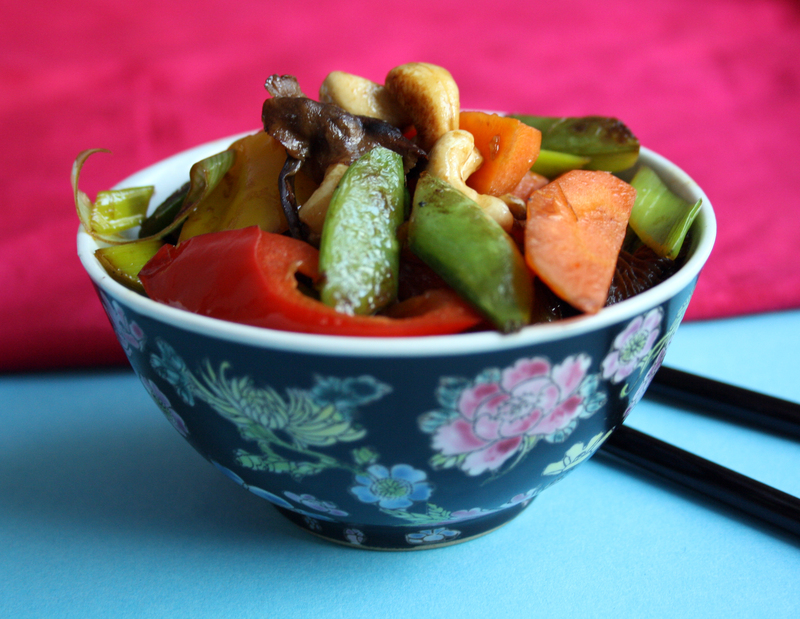 The Chinese cuisine rests heavily on the holy trinity of sesame oil, garlic and ginger, and so does this stir – fry. 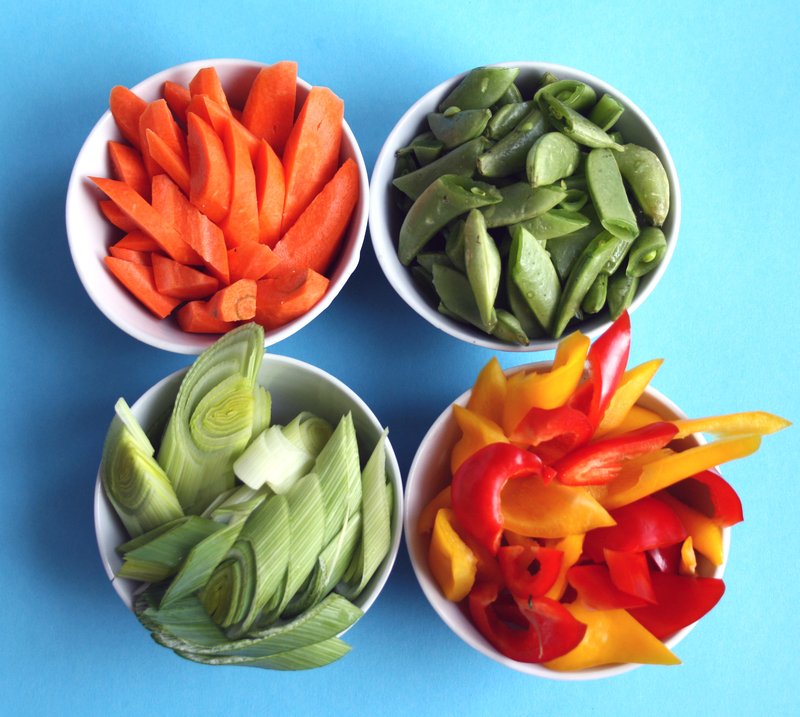 You can use any veggies that you like, but remember to be fast! I always, always overdo it. So anyhow, first the crispier stuff in the wok and after the softer. Heat peanut oil in the wok and throw in the ginger and garlic. Fry for one minute and add the mushrooms and the rest of the veggies. Fry for 1 -2 minutes, then add the cashewnuts. Fry for one minute and add the seasonings. 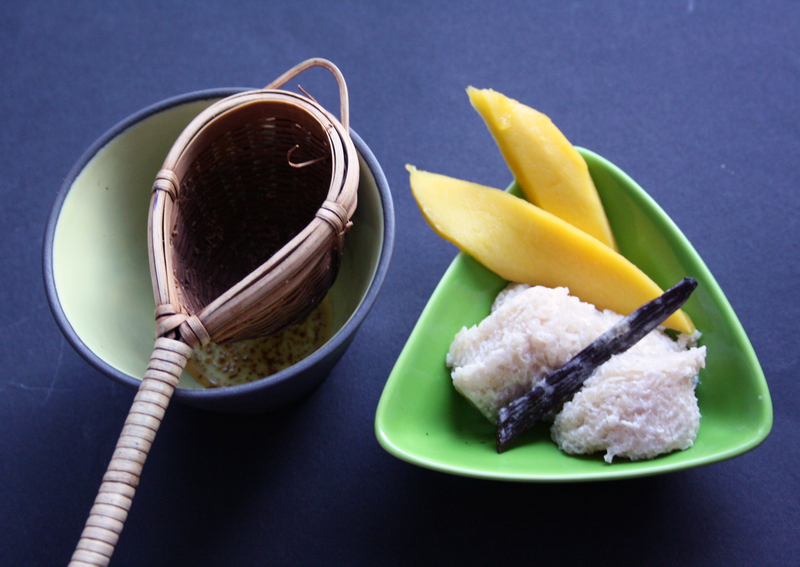 This is a favourite dessert from Thailand, updated with a bit of vanilla. First you should soak the rice for four or more hours in cold water, in the fridge. Then, in a cooking pot, bring to boil the coconut milk, vanilla pod, sugar, salt and rice. Let simmer until the coconut milk has absorbed. Then steam the rice for 15 minutes until it’s sticky and soft. I used a normal sieve for the purpose, stuck into a cooking pot and covered with a lid. Serve with sliced mango. Nowadays we live in an eternal summer of the supermarket aisle. It’s like in paradise, everything is available for us all year round, all different tastes from everywhere in the world, and amidst all that we graze innocently like Adam and Eve, knowing nothing of evil. I would not hesitate calling today’s food production evil! If you have not seen the movie Food Inc, I strongly recommend it for everyone. You may think you already know all that scary stuff about how food is produced today, but honestly, when watching those abundant, lucrative supermarket shelves it is quite easy to lull yourself into a content forgetfulness and just allow yourself to be fed, like at Mother’s breast, with no worries. I recently heard the Finnish author and passionate vegan, Antti Nylén, talk. He said something brilliant, when asked how he feels about the fact that he voluntarily refuses so much potential delight in his life. He answered: ” Abstinence in itself is a delight”, in the most laconic manner. It was great, and wonderfully true too, though the delights of abstinence are widely forgotten in our society. By this I don’t mean that we should completely refuse some nice edible things, but to perhaps eat them less, and savour more. I should personally really cut down on lemon, since I know somebody probably suffers for picking them somewhere. 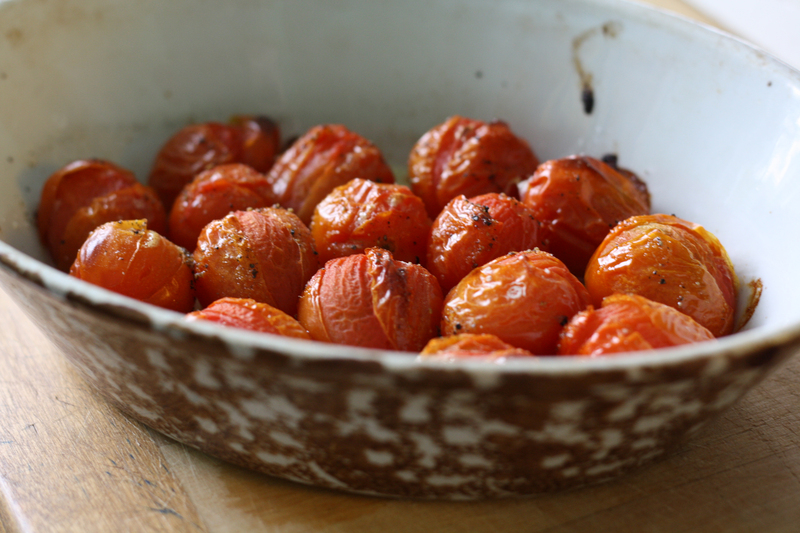 I love the fact that there are still a couple of things that you can’t taste year – round. One of my favourites is Finnish early apple varieties, especially “punakaneli”, Malus Domestica ´Koritschnevoje` that is a lovely thin – peeled, sweet, red – cheeked apple that has an aftertaste of cinnamon. None of the varieties of other apples comes anywhere near this one in taste I think. The other favourite seasonal food of mine is fresh broad beans (vicia faba). I adore broad beans: of course, they are a great local protein source (we don’t have that many pulses growing in Finland), and besides they are simply such a beautiful design. You know, how you open the shell and each one of the beans is nested in this white fluffy padding, in a little hook, like a treasure that they are. I could write a poem on broad beans! You can of course eat them dried too, but that’s a whole other story. Common for these both things is that besides being seasonal, you need to pretty much grow them yourself in order to get some. The apple variety I’m talking about is very common in Finnish home gardens, but the commercial orchards don’t seem to grow it, I guess since it doesn’t keep very well. Fresh broad beans you might find here in an organic store if you are really lucky, and for them the season is already well past. 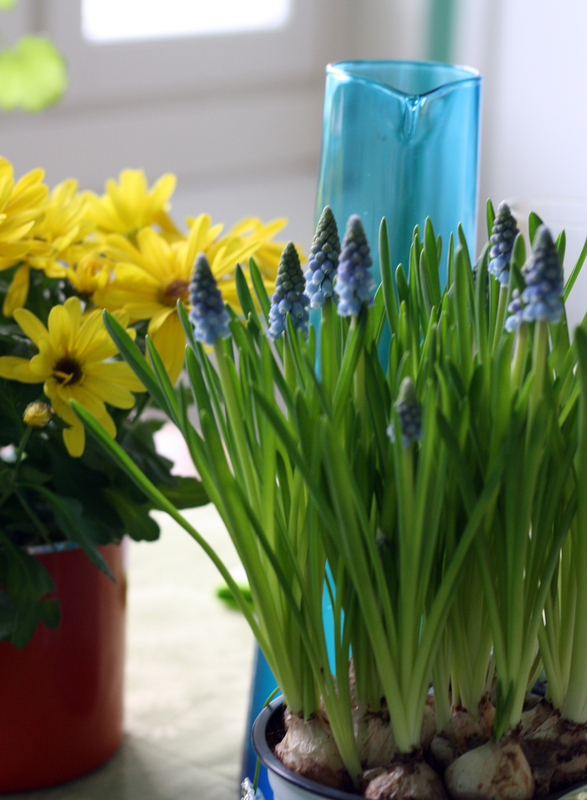 But they are easy to grow, though mostly not very commonly known among home gardeners. I shelled the broad beans and steamed them and the long beans a few minutes. The broad beans only need like three minutes, the long beans a little longer. Then I chopped the chillies and garlic finely, and combined these two with the beans, tomatoes and chopped up coriander. The dressing I made out of fresh lemon juice, oil and a pinch of salt. 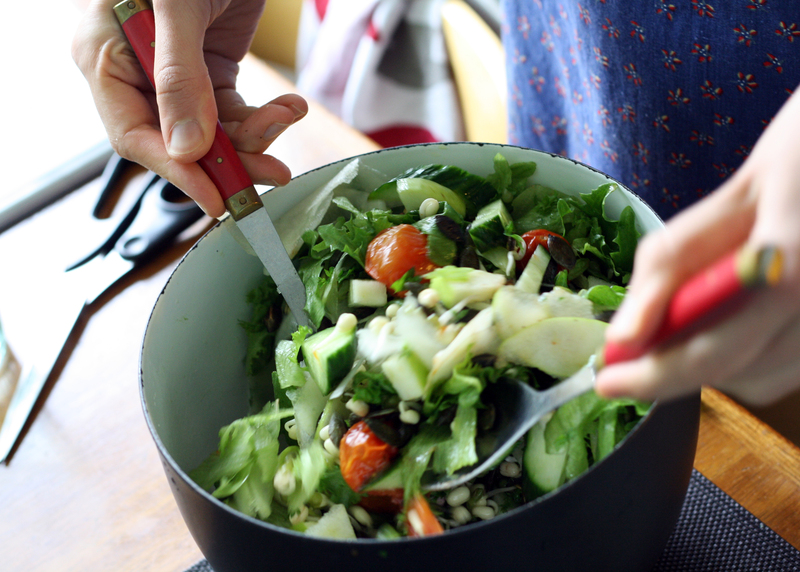 This particular salad was fiercely hot, but the amount of chilli can be adjusted. I think the taste combination of fresh coriander, chili, lemon and garlic is simply divine, fresh and hot at the same time. And as dessert another seasonal thing, which is a veganized version of a really traditional Finnish dessert: Lingonberry mousse. Originally it is made with lingonberries (or some other berries), whipped cream and quark. It is very simple to make, and fluffy and delicious. I think my veganized version was surprisingly nice too, since often this kind of stuff just doesn’t work at all. I whipped up the cream and folded in the rest of the ingredients. That’s it! The smell of boiling berries always brings me back to my childhood. A berry soup, kiisseli, was something that I would eat every morning with my oatmeal porridge. I didn’t like it. My mom would make it so that it contained whole black currants, straight out of the freezer, and I hated their thick peels and the sauer taste. Only as an adult I’ve learned to appreciate the taste of black currant. And berry soup? That’s something I hardly ever make. Here I’ll write about a dessert that my mom sometimes made, and I think it originates from her own childhood. It is called Stablemaster’s Berry Soup, and it is made of very simple ingredients: those people 50 years ago had some dried up rye bread in their cupboard, a gooseberry bush and some fresh cream in their cellar, and as an exotic ingredient just a pinch of cocoa powder. These they combined in an inventive way. This dessert is a bit like life some fifty years ago, delightful in simple way, as our life now is delightful in a complex way. Those people had a sense of safety within the Big Circles of life: the winter, cold and snowy, would follow the summer, people would marry, have children, grow old and die, and work hard in between. For an individual life was unpredictable, in a sense that the world was not such a safe place to be in, but the communities were strong, even to the point of suffocating their members. Nowadays, we have a lot of personal safety: good dental care, women’s rights, a possibility to reach anyone we wish, and even be anybody we wish to be. But we feel disconnected, don’t know what to do with our relationships, don’t know if there will ever be a winter on this planet again. Would I personally change my complicated liberty to a simpler life, with a sense of continuity ? Sometimes I think I would, but also I know that the freedom of our unsecure time is a great gift to someone like me. So I content myself, with making a dessert from the olden times, and have no more romantic yearnings for an imaginary simple life. Berry soup is a very Finnish concept, and I don’t know whether it exists anywhere else. The traditional way to make it is to boil some berries, sieve through, and thicken the remaining juice with potato starch. After that some whole berries or fruits can still be added. This dessert, which for some reason is called Stablemaster’s Berry Soup, is traditionally made of gooseberries, but any other sauer – tasting berries can be used too, as well as rhubarb or apple. It doesn’t sound very luxurious, but somehow the sweet – and – sauer taste of gooseberries and the crispy bread crumbles are really delicious together. I decided to make the berry soup in a really old -fashioned way, so that I would actually sieve it, since the gooseberries have these funny “tails” that would maybe not be so nice eaten. I started by boiling the berries in water about 5 minutes, until they had fallen apart for a bit. Then I put it through a sieve, and added the sugar. I diluted the potato starch to 1/2 dl water in a separate bowl. Then I took the berry soup pot from the stove, and poured in slowly the potato starch liquid, mixing the soup carefully in order to avoid lumps. Then I put the pot back to the stove and brought it to boiling temperature, so that I would just see the first bubble appearing on the surface. Then I took it off the stove. You should not boil it! I don’t know why, but this is the by – the – book way a Finnish berry soup is made. As a condiment for the berry soup I made the bread crumbs: First I crumbled up some dried rye bread, and then fried it in oil on a frying pan, together with the sugar and cocoa powder. Then I poured the gooseberry soup into a bowl, and sprinkled it with the bread crumb mixture and whipped soy cream. As the strawberry season is still going on, there could hardly be any reasons why not to eat them all the time.. this is a simple dessert I made the other day. The vinegar combined with sugar gives the strawberries a taste that is really interesting, not bitter or sour, but just tangy. My friend who was eating it thought it felt odd in the throat, but I simply loved it. Basil tastes good with strawberries, as well as rosemary. I sliced the strawberries, and made the marinade by whisking together the ingredients. Then I poured it over the strawberries and let it wait for half an hour before serving. The cream I made simply by combining the ingredients with the chopped basil leaves.